We are the North County Transit District! Since our inception in 1975, NCTD has been helping people get where they need to be. 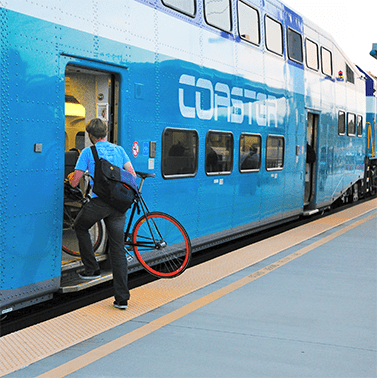 By providing public transportation for North San Diego County, we are able to serve more than 10 million passengers every year. To deliver safe, convenient, reliable, and user-friendly public transportation services. NCTD’s community outreach efforts focus on increasing awareness about public transit projects, options, and benefits. We work with a variety of audiences including schools, employers, businesses, and service organizations. At these events we also receive your feedback about our services and bring it back to the planning team for evaluation. Our outreach team is present at street fairs, fundraisers, festivals, business expos, employee resource fairs, and college special events, among other community events. At such events, the public learns about NCTD’s services and resources and has the opportunity to ask questions about trip planning, schedules, benefits of switching to transit, and special fares and discounts for select riders.